The tri-state area’s biggest, most electrifying fall event! 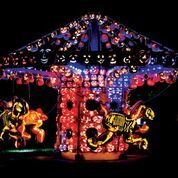 Meander through an 18th-century landscape and discover a breathtaking display of more than 7,000 illuminated jack o’lanterns—all designed and hand-carved on site by our team of artisans. Complete with synchronized lighting and an original soundtrack! Get mesmerized by a color-changing star show in the Pumpkin Planetarium. Visit our brand new medieval castle and listen for the who-whooo… a flock of jack o’lantern owls is standing guard! This innovative spectacle is not-to-be-missed!